Background/aim: Reduction mammoplasty is a common surgical procedure. We report the incidence of nonproliferative and proliferative breast lesions in breast reduction specimens from a single institution over a 6-year period. Materials and methods: The histopathology reports of all patients were analyzed. The clinical and histopathological findings of the patients were recorded. Results: Between 2004 and 2010, 106 patients underwent breast reduction. Fifty-six patients (52.8%) had proliferative breast lesions, 84 patients (79.2%) had nonproliferative lesions, 8 patients (7.5%) had columnar cell lesions without atypia, 61 patients (57.5%) had columnar cell lesions with atypia, 5 patients (4.7%) had atypical ductal hyperplasia, and 6 patients (5.6%) had lobular carcinoma in situ. No invasive breast cancer was identified. Conclusion: In Turkey, there is limited evidence regarding the role of histopathological analysis in reduction mammoplasty. Moreover, none of the previous studies determined columnar cell lesion rates in reduction mammoplasty patients. The detection of significantly elevated columnar cell lesions, with or without atypia, especially in patients under the age of 40, increases the importance of screening tests, especially in Turkey, which has a high incidence of breast cancer in early ages, and addresses the need to starting screening tests early in these patients. Karabela-Bouropoulou V, Liapi-Avgeri G, Iliopoulou E, Agnantis NJ. Histopathological findings in breast tissue specimens from reduction mammoplasties. Pathol Res Pract ; 190: 792–798. Pitanguy I, Torres E, Salgado F, Pires Viana GA. Breast pathology and reduction mammaplasty. Plast Reconstr Surg ; 115: 729–734. Youngson BJ, Mulligan AM. Fibrocystic change and columnar cell lesions. In: O’Malley FP, Pinder SE, Mulligan AM, editors. Breast Pathology. 2nd ed. Philadelphia, PA, USA: Elsevier Saunders; 2011. pp. 167–180. Kakagia D, Fragia K, Grekou A, Tsoutsos D. Reduction mammaplasty specimens and occult breast carcinomas. Eur J Surg Oncol 2005; 31: 19–21. Horo AG, Acker O, Roussel E, Marret H, Body G. Mammo- plasty for symmetry in breast reconstruction and histologic as- sessment. Can J Surg 2011; 54: 201–205. Snyderman RK, Lizardo JG. Statistical study of malignancies found before, during, or after routine breast plastic operations. Plast Reconst Surg 1960; 25: 253–256. Pennisi VR, Capozzi A. The incidence of obscure carcinoma in subcutaneous mastectomy. Results of a national survey. Plast Reconstr Surg 1975; 56: 9–12. Cruz NI, Guerrero A, Gonzalez CI. Current findings in the pathological evaluation of breast reduction specimens. Bol Asoc Med PR 1989; 81: 387–389. Colwell AS, Kukreja J, Breuing KH, Lester S, Orgill DP. Occult breast carcinoma in reduction mammaplasty specimens: 14- year experience. Plast Reconstr Surg 2004; 113: 1984–1988. Viana GA, Pitanguy I, Torres E. Histopathological findings in surgical specimens obtained from reduction mammaplasties. Breast 2005; 14: 242–248. Dotto J, Kluk M, Geramizadeh B, Tavassoli FA. Frequency of clinically occult intraepithelial and invasive neoplasia in reduction mammoplasty specimens: a study of 516 cases. Int J Surg Pathol 2008; 16: 25–30. Mazhar K, Goyal A, Coulson S, Caddy C. Abstract P6-03- Breast reduction mammoplasty and incidence of occult carcinoma. A 10 year experience. Cancer Res 2010; 70 (24 Suppl. ): P6-03-02. Rajabian MH, Kumar PV. Histopathological evaluation of reduction mammaplasty specimens to detect occult breast cancer: a report from Southern Iran. World J Plast Surg 2012; : 71–75. Ozmen V, Ozcinar B, Karanlik H, Cabioglu N, Tukenmez M, Disci R, Ozmen T, Igci A, Muslumanoglu M, Kecer M et al. Breast cancer risk factors in Turkish women--a University Hospital based nested case control study. World J Surg Oncol ; 7: 37. Hanby AM, Ellis IO, Schnitt SJ. Columnar cell lesions. In: Lakhani SR, Ellis IO, Schnitt SJ, Tan PH, van de Vijver MJ, editors. WHO Classification of Tumors of the Breast. 4thed. Lyon, France: IARC; 2012. p. 86. ISNAD ALBAYRAK, AYNUR , MESCİ, ÇİĞDEM GÜLER , GÜLER, GÜLNUR . "Histopathological findings obtained from reduction mammoplasty specimens". 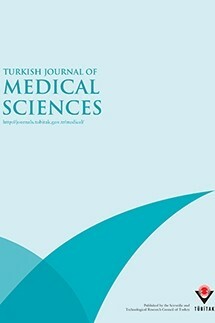 Turkish Journal of Medical Sciences 45 / 6 (December 2015): 1374-1379.